So last week I had my second knee surgery in 4 months. This one was for my ACL. I am very appreciative that my husband, mom, kiddos, friends, and my staff have been so very very helpful. They have brought me ice packs and meals; become my taxi drivers; helped me get dressed (FYI- only family on the dressing assist). I do NOT like asking for help, and I do NOT like this feeling of dependence. Right now, I am dependent on the schedules, availability, and willingness of others. I am thankful for them, but it has made me mindful of the seniors we serve. Remember to truly see the heart of those we serve and those we work with. See the vibrancy, independence, and resourcefulness in others. See their strengths, skills and not their frailty and impairments. This will be all of us one day, should we be so lucky to have those golden years. Last month we hosted the Case Manager resource fair at Valley Medical Center and next week we have Tacoma General. We are excited to have raised more than $2000 for both events for each hospital to support their low-income patients in need. We love receiving feedback from the hospital staff like this one- "Hi Amy, thanks for another WONDERFUL event- staff is energized and feel it is so very helpful!" -Lisa. 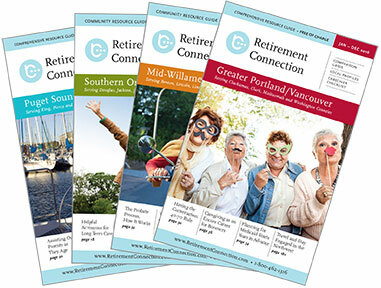 All of what we do at Retirement Connection is because of the support our sponsors provide by advertising in the print guide. Thank you to every sponsor, their support allows us to be a part of this community. These events are full, but space remains available for the October Valley Medical event for sponsors not yet registered. It will open to others later space permitting. 3 PM See the Expansion at Quail Park of Lynnwood! Do you know someone that has recently changed positions? We want to know… Each month we will share the updates in our monthly newsletter, helping you stay connected and keep informed about community changes." Click Here to send us any updates. Sometimes our work schedules are dictated to us by the type of work, coordination with co-workers, or customer needs. Today's workplace is different than 20 years ago before smartphones, when television went off the air at midnight, and most stores were closed by 8pm. We live in a 24/7 world. With 4 generations in the workplace today, be mindful of the changing times- If the job is getting done well and on deadline- then good job. Thank your team!